This was the ideal work to represent the principles of neo-impressionism exhibited in 1886 by the founder and the main representative of neo-impressionism. The painting depicts people having a vacation on the island of Seine River. Under the sun, in the riverside, people were having a rest, walking and fishing. It was apparent to see a few figures were going boating on the water. The afternoon sun dragged people down and the painting looked very quiet and harmonious. This painting mainly used the pointillism. 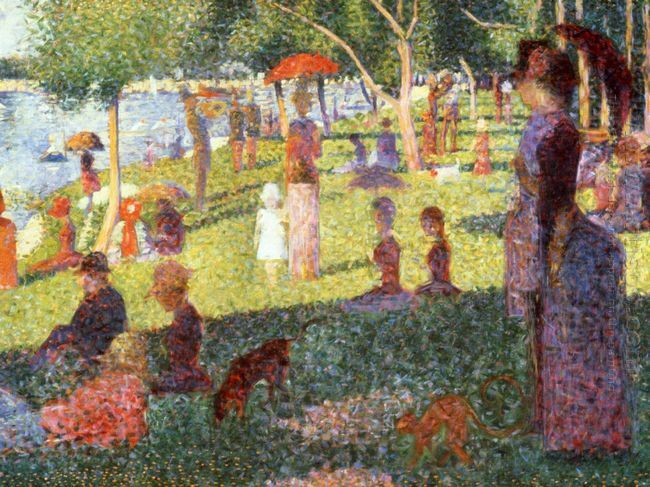 To finish this painting, Seurat painted more than 30 pieces and color drafts and spent two years drawing this monumental work, which was one of the most important events in modern art. Seurat was engaged in writing according to his theory and he sought to make the painting’s composition in accordance to the geometry. Based on the rule of golden section, he made a completely new composition for the relationship between the object, size and shape, the balance of the vertical and horizontal line, and figure’s angle configuration. He focused on the characteristics and volume of static sense of artistic image and created the shape order of the painting. The painting’s figures were arranged according to the perspective and the accurate mathematical formulas and were repeated to compose the painting in decreasing the size in the depth of characters. The woman taking the kids was placed in the geometric center. There was a large contrast image and each part was made up of thousands of parallel complementary small brush strokes of colors, making our eyes turn from the prospect to the beautiful background. The whole painting was achieved the balance and unity in the color volume. In this painting, the painter used color segmentation and geometric relationship between vertical and horizontal line and depicted 40 people playing in the big bowl Island scenario under the burning sun of midsummer, the painting was filled with a sense of magic air, without personality and sense of life in figures and the mysterious isolated characteristics. This painting of Seurat indicated Cezanne‘s art and the later Cubism, abstract expressionism and surrealism, enabling him became one of the pioneers of modern art.